On the week that Stranger Things 2 came out on Netflix, it is reported that nearly 70 MILLION viewers watched as Sean Astin’s character: Bob Newby was introduced. And as with all of Sean Astin’s movie characters, Bob was endearing enough to make you love him immediately. Every character he plays is memorable: Mikey (Goonies), Samwise Gamgee (Lord Of The Rings – Trilogy), Daniell Reuttiger (Rudy), Doug (50 First Dates), and Marcus (Forever Strong) just to name a few. Every encounter I’ve had with Sean has also been memorable. Why is JesterZ Improv the Title Sponsor in an after school running foundation? It’s deeper than just getting kids to run. It’s about running for someone else… it’s about running for someone you know that is having health problems, or loss, or heartache or the myriad of other problems we all face. A family member, a neighbor, a friend, teacher, etc. 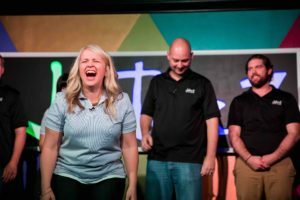 JesterZ improv is dedicated to bringing family and friends together to create positive memories through laughter. In our classes (teens and adults) JesterZ teach confidence and commitment to choice. It’s about supporting others and giving life to an idea and exploring it together. We preach: “It’s not about you, it’s about them”… and when everyone has that as a focus, great things happen!! 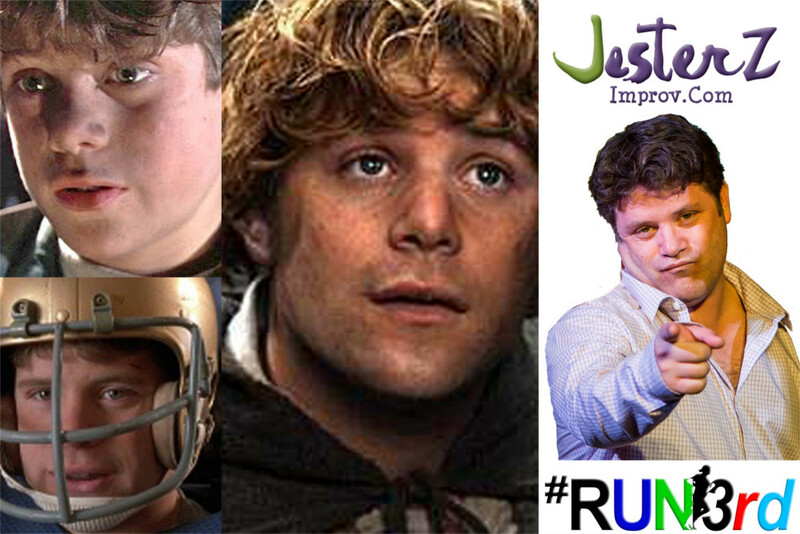 SEAN ASTIN DOES IMPROV COMEDY – AGAIN! On Friday March 23rd (2 weeks before the April 7th event) Sean will, once again, join the JesterZ Improv Main Stage Cast for a totally improvised comedy show! Nothing scripted – nothing memorized – everything hilarious! Taking suggestions from the audience (YOU) to create instant hilarity ON-THE-SPOT!! It’s “Whose Line Is It, Anyway” meets Bob Newby, Superhero!! JesterZ will donate proceeds from this event to participating schools to support (or start) running programs and provide equipment and running gear. We want to help educate youth about health, about doing hard things, about creating routines to accomplish goals, about thinking outside of themselves, about caring. $125 – VIP Platinum Section!